Be the first to share your favorite memory, photo or story of Simone. This memorial page is dedicated for family, friends and future generations to celebrate the life of their loved one. 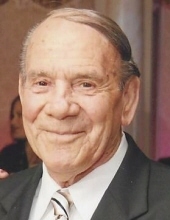 Simone “ Sam “ Gugliuzza, 84, died Wednesday, December 5, 2018 at Hackensack University Medical Center . Born in Sicily, Italy he lived in Newark before moving to North Arlington in 1967. He was a member of the International Longshoremen’s Association, AFL-CIO Local # 1478-2 working at Maher Terminal in Port Newark for over 30 years before retiring. Simone was the beloved husband of Josephine “ Pina “ ( nee Mistretta ), the devoted father of Manny Gugliuzza and his wife Maryann and Cathy Sperandeo and her husband Francesco, the cherished grandfather of Salvatore, Alexandra and Gianna Simone, the doting great-grandfather of Isabella Rose, the loving brother of Giuseppe Gugliuzza and his wife Maria, and dear brother-in-law of Maria Gugliuzza and Rosina Mistretta. Funeral from the Parow Funeral Home 185 Ridge Rd., North Arlington on Monday, December 10th at 9 a.m. thence to Our Lady Queen of Peace Church, North Arlington for the Funeral Mass at 10 a.m. Entombment Holy Cross Chapel Mausoleum, North Arlington. The family will receive friends on Sunday 2-6 p.m. In lieu of flowers the family would appreciate donations made to the North Arlington Volunteer Emergency Squad P.O. Box # 7088, North Arlington , N.J. 07031. To send flowers or a remembrance gift to the family of Simone " Sam " Gugliuzza, please visit our Tribute Store. "Email Address" would like to share the life celebration of Simone " Sam " Gugliuzza. Click on the "link" to go to share a favorite memory or leave a condolence message for the family.